Horses used for rodeos or other businesses are transported regularly in double-deck or "pot" trailers. The "Horse Transportation Safety Act," SB 1459, introduced by Senator Mark Kirk (R-Ill) and companion HB 4440, which was recently introduced by Representative Steve Cohen (D-Tenn.), threatens to end this method of moving horses from place to place. 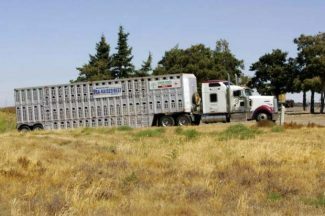 Several states have already enacted legislation to prohibit the hauling of horses in double deck trailers but the federal legislation would outlaw the practice from coast to coast. The practice of hauling horses to a processing plant in a double deck trailer was made illegal in 2007. Jim Korkow with Korkow Rodeos, Pierre, S.D., said hauling horses safely from rodeo to rodeo with double-deck trucks can be done. If he doesn't keep the horses safe and healthy, he will not be hired back to a rodeo. Korkow points out that a safe and comfortable ride for his horses is not only the humane thing to do, it is obviously in his best interests business-wise. "We haul from coast to coast, border to border. I make my living with horses. The only thing we've got going is rodeo stock, we don't have oil wells or a used car business. I get jobs because of the reputation of the professional athletes that are on the truck. They are some of the best in the country," he said. "If hauling horses on a double-deck trailer was detrimental to their health, I wouldn't be in business." Trailers made specially for horses, with extra headroom and hinges and pins that have been moved to prevent bruising or lacerations are utilized to transport Korkow horses across the country. The ramps don't take up headroom as they do in many cattle pots, but they are against the wall, giving extra room for horses' heads. 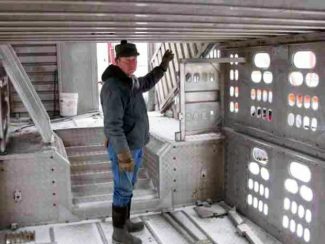 "I'm 5 feet 11 inches tall and I can stand with a hat on, in any of the sections in my trailers. That is plenty of room for a horse." According to the PRCA, the average height of a horse is approximately 60 inches. Floor-to ceiling-clearance in most double-level trailers used to haul bucking horses range from 71 to 75 inches. This leaves from 11 to 15 inches of headroom for the average horse in these modified trailers. One trailer is generally used for hauling bucking horses and bulls, and the horses go on the top where there is more room, while the bulls are loaded in the "belly" or the bottom where there is less headroom. The bucking stock they haul to rodeos are comfortable around one another, Korkow points out, saying that they eat together at a feed bunk all winter with little to no fighting. "They've established a rank and they have learned to get along with one another, even the young ones with the older ones." Korkow said his horses don't mind being loaded in the trailer and adds, "If I had a loading chute with a trailer backed up to it sitting in the pasture, you could go out there and find horses in the trailer. They are that comfortable in there." While he realizes there can be issues hauling horses in close proximity that are not comfortable with one another, sorting the horses can eliminate a lot of problems. Overcrowding of highways is an issue, especially as one travels outside of the Midwest, Korkow said, which he and his son T.J., often do for rodeos. "If I can't use a double deck trailer, I'll have to use twice as many trucks to haul my livestock. This not only costs me money, it puts more emissions out there, tears up the road twice as fast and actually creates twice as many opportunities for accidents." The proposed legislation is aimed at putting a stop to rodeo activity altogether, Korkow believes. "They are using the example of a truck and trailer that took a corner too fast and tipped over five years ago. Well I don't care if you are in a car or a pickup or a truck pulling a single deck trailer, if you take a corner too fast, you will tip over. Passing a law isn't going to fix that problem," he said. "There are organizations that have been working to stop rodeos for years and they haven't been able to get it done. This is just another backdoor attempt at accomplishing that." Korkow believes that if the special interest groups lobbying in favor of the legislation are successful in banning horses from being hauled in double deck trailers, it will only be a matter of time before cattle, hogs and sheep are the next on the chopping block. Dr. Lynn Stadheim, a veterinarian from Belle Fourche, S.D., who has worked extensively with buyers of horses destined for processing plants, said double deck trailers can be just as safe as any other trailer for horses. He said safety is more dependent upon the methodology and care taken while loading the horses. "If you've ever been around 30 or 40 horses, they sort themselves pretty well. If they want to get away so they don't get pestered, they stand back, even if they don't get to eat. The ones that are biting, kicking, squealing are up at the hay rack." Stadheim points out that horses always develop a pecking order and sorting the horses with that in mind will prevent a lot of problems. He also explained that horses going to Canada to a processing plant are not allowed across the border with any kind of an open wound, so the truckers and horse handlers have a clear disincentive to load the horses in manner in which they will fight, bite and kick. Loading mares and geldings separately is another important concept, he said. Only three stallions are allowed per trailer, too, which helps keep the disruptions to a minimum. Cindy Schonholtz who works for the Professional Rodeo Cowboys Association said this subject has come up every year for five or six years. "We've got a lobbyist in D.C. working on the issue." 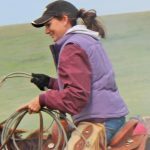 She said the PRCA has gone to great lengths to teach legislators, veterinarians and others how stock contractors modify their trailers and how safe the horses really are. In order to show representatives from two veterinarian organizations first-hand how horses load and haul in the specially-modified trailers, the PRCA has planned an educational event at stock contractor Ike Sankey's ranch near Billings, Mont., where representatives will have the opportunity to watch horses being loaded and unloaded in the same manner as they would before or after a rodeo. "We are continuing to try and get more information out," Shonholtz said. "The current practice doesn't hurt horses," Korkow said. He points out that a straight trailer might even be more likely to tip than a double deck trailer because the weight is positioned higher and the wind can grab it more easily. "All this will do is cost me a lot of money and cause confusion." Editor's note: Dr. Lynn Stadheim is the author's father-in-law.